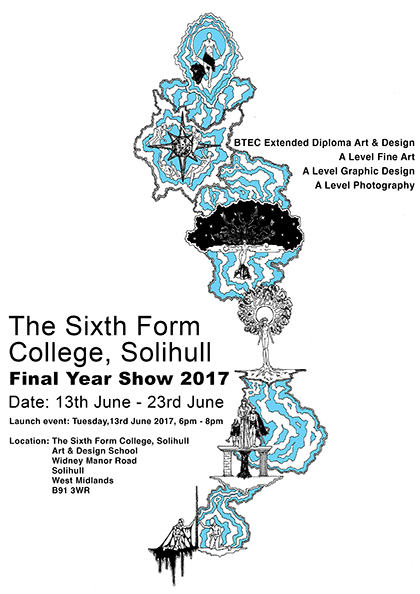 The Visual Arts department at The Sixth Form College in Solihull is holding an end-of-year showcase of artwork in June. The Final Year Art Exhibition will be showing off work from both first year and second year students from 13 – 23 June, with a launch open to the public on the evening of 13 June (6.00 – 8.00pm). From 14 – 23 June, the exhibition is open from 10.00am – 4.00pm by appointment only. The College has students across four Art courses, including A levels in Fine Art, Graphics and Photography, as well as a BTEC Extended Diploma in Art & Design. In all these courses, a significant portfolio of artwork is required and forms a significant part of their final marks. As well as showcasing the finished work, scrapbooks will also be available on request to show how students got to the final piece of work and what inspired their work. At the launch event on Tuesday 13 June, refreshments will be provided as staff, students and parents celebrate the achievements of the students. Prizes and awards will also be given to recommended students during the evening.